Inspiration for the pieces I make comes from the garden, nature, mathematics, historical embroideries, ancient prints and the magical colours and textures of the glass itself. My aim is to create original designs to suit the individuals that commission the work and who share the joy of this most ancient of crafts. I undertake work within North London, Northants, Bedfordshire, Oxfordshire and Buckinghamshire. Domestic, heraldic, minatures, ecclesiastical stained glass. I am a designer and maker of decorative stained glass for windows, doors, free hanging panels, wallpieces and large mirrors. From the Riverside Antique & Collectable Centre in Sawbridgeworth Caroline mainly retails glass jewellery with the occasional larger wall piece. Stained Glass Studios make Stained Glass Windows for any home in London and the Home Counties..
Horus Glass specialises in the creation of bespoke and customised stained glass pieces. We list sites from world wide. 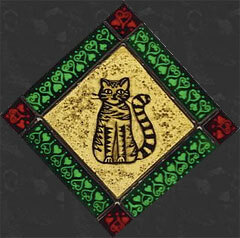 All traditional stained glass & fused glass URLs are invited for consideration.